Using the 37th African Division, Mangin had launched a counter attack against the Germans at Fleury village in the middle of July. It failed because of poor organisation due to the speed with which it was launched, and Petain forbade all further assaults until he judged the time to be ready. Falkenhayn was removed as German Supremo on August 27th, the day that Rumania entered the war on the Allied side and was sent to that front where he performed adequately. On the 28th his replacements arrived, von Hindenburg and the faithful Ludendorff, who reinforced Falkehayn's last instruction. A sort of calm now settled over the ruined charnel house landscape and continued into September. Haig closed down the battle west of the Ancre river. No advance had been made in this area at all in July and he now concentrated on a series of operations in the eastern sector. Officially there are 12 separate battles within the overall "Battle of the Somme", some spreading over five and six weeks. In practice what should have happened in these operations was that the wood or village being attacked would have been saturated by British artillery fire and machine gun barrages and equally the strong points adjacent to that place so that enfilade fire could also be stopped. The infantry could then have occupied the objective and made ready for the next assault on the next target and so on, and so on. It didn't work along the Somme, however. The German defenders were very strongly dug in and their men were staunch in defénce. 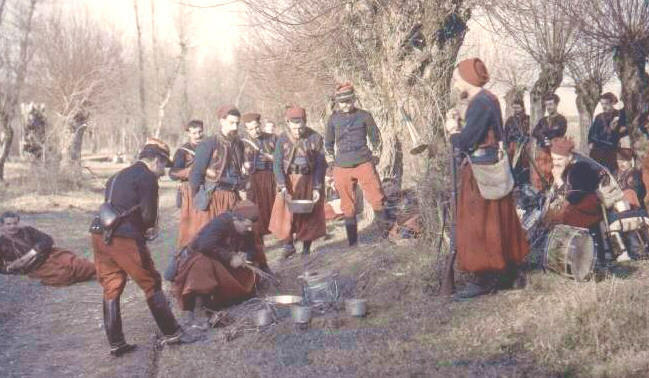 Standard infantry policy was to keep counterattack units ready to launch instant attacks against incoming units when they had arrived at an objective having often suffered grave losses in their own ranks. Their artillery was under excellent management such that the guns of all nearby units could be called on to support other units being attacked. It was very difficult for the British to keep all their preparations hidden for each assault since the target of that assault was obvious to the defenders for purely tactical reasons. It became common for units to loose half their officers and men crossing No Mans Land in the face of these expected attacks, and due to their losses they were in no position to hold on to the ruins of the objective in the face of determined and well organized counter attacks. Somme-August continues on left below. The result was that a section of the chess board had to be attacked many times over the same ground into the same gunfire, usually with the same macabre results. This, on occasions, produced the appalling need for men to advance over ground they had previously traversed, stepping over their own rotting dead whom they had known in life not long before. Equally, the defenders suffered from the incoming British artillery barrages and Ernst Jünger wrote in his book Storm of Steel of the quarry at Guillemont in August: the ground all round as far as the eye could see was ploughed by shells and you searched in vain for one blade of grass. This churned up battlefield was ghastly, and among the living lay the dead. As we dug ourselves in we found them stacked in layers on top of each other. One company after the other had been shoved into the drumfire and steadily annihilated. The corpses were covered with masses of earth turned up by the shellfire, and the next company advanced in place of the fallen. There seemed to be no way to break the deadlock. But; the tanks were coming! In Flanders' fields. . . These ideals feed into a perfect depiction of England and its population. The rather dotty British obsession with the weather; the lounging about outdoors, the beauty of the countryside, the emphasis on a 'green and pleasant land', and finally, the traditional British reserve; ignoring the big events and unable to articulate the small. The summer of 1914 works as a perfect counterpoise to the war itself. At the same time it's become an inevitable part of the war story. What has however struck me is the assumption that the summer of 1914 seems to addle people's brains in some way. For a start, nobody does anything except sit about outside. No domestic jobs are done, nobody works for a living (they go off and do that during the war, obviously! ), and it gets dark suspiciously late. Secondly, the heat seems to somehow prevent political debate. Surely not everyone's reaction to the situation in Europe was either 'Oh, don't worry about some silly country no-one has ever heard of!' or 'There'll be a war; you mark my words!'. It seems to me that authors are very keen to induce a type of collective heatstroke that avoids anyone discussing war in complex ways. This of course means that when it does take its casualties, they will be all the more surprising to the participants. The summer of 1914 was indeed, the hottest on record, and since British newspapers reported the weather on a regular basis since 1860, this is a fair claim to make. However, despite this, it all sounds rather good fun, in a jolly sort of way. Even the torrid affairs doomed to failure because of the inevitable shadow of war seem rather interesting. The reader is meant to see these acts as the last of an era, and after 1914 it always rains in the summertime of these novels. Yet somehow, I can't really see why loafing about outside until it gets dark and eyeing up carefree young men is such a bad thing at all. 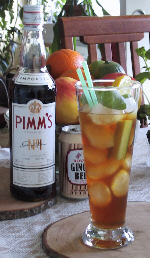 . .
Esther MacCallum-Stewart wrote this entry in the garden with a glass of Pimms, of course, but who cares about some silly war! Bear with me while I linger on this subject again, because for me today and tomorrow are days to reflect upon. 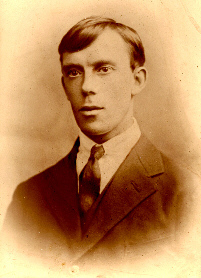 Ninety years ago today, Jack Winspear, 27, was "somewhere in France," marching along a hastily prepared road on his way to the Somme Valley. Having enlisted for service in 1914, he had already seen most of his mates killed at Ypres and at Ploegsteert Wood - "Wipers" and "Plugstreet Wood" as the soldiers called them. Most of his battalion had been decimated at Ypres, so he had been placed on stretcher-bearer duty before being assigned to a new division, only for there to be the same outcome. And so it went on. On June 30th, 1916, marching with the column that snaked along for miles and miles, he would likely have passed the extra-large trenches dug out in readiness for mass burials following what was expected to be the decisive battle in a war that had already claimed far too many lives. And Jack would also have seen the new casualty clearing stations being set up, and hospital trains at the ready. 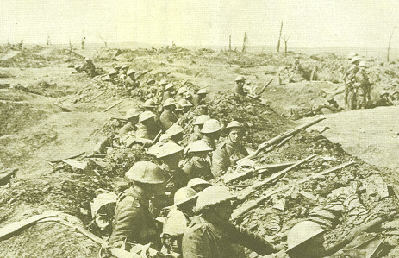 The land around was scarred after almost two years of incessant fighting, and I expect that Jack just wanted to be home as he stood with his comrades and listened to the Divisional Commander give a rousing speech, telling the lads that they should be proud to be doing their bit, now that the "big show" was about to start. My grandfather came home from the war, put away his medals and barely spoke of what he had seen and done, shunning any questions by leaving the room. But my father managed to weasel a few quickly-recounted memories from him. Those stories were branded into me young by a curiosity that matched my father's when he was a boy. 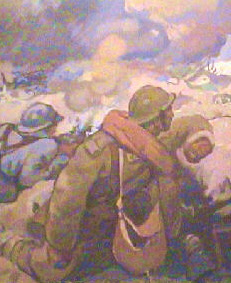 Grandad told my father about waiting his turn to step onto the ladder that led from the trench and onto the battlefield. With a ration of rum still warm on his breath, along with his mates he was waiting for the whistle, the signal to go "over the top' before running towards the enemy with bayonets fixed. How he was supposed to run, I don't know, because he would have had a pack on his back weighing at least 68lbs. But run he did, and on that day, in the early hours of the Battle of the Somme, it was straight into hell. Within minutes he was hit, the shell knocking him up into the air and onto the bodies of fallen comrades. With the screams of dying men around him, after hours and hours of waiting for the stretcher-bearers to come, he eventually listed into unconsciousness and woke up days later in a military hospital. The Battle of the Somme, which began on July 1st, 1916, will be discussed and debated by military minds, historians and social scientists for decades to come, not least because of its continuing relevance. Winston Churchill said that with the Great War came humankind's realization that it could obliterate itself completely. This was never more true than at the Battle of the Somme. A short excerpt on the flyleaf of a new book about the battle by the distinguished historian, Martin Gilbert, speaks volumes: "In just 138 days of fighting, an average of more than 2,000 men per day were killed, 310,000 in all. The Allied forces lost nearly 150,000 men. And not one of the Allied objectives of the first day was reached." But stats are stats and soon any connection with the suffering of another human being is replaced by a number, whether it's the dead in Somalia, the dying in Darfur or Gaza or Iraq, New Orleans. Jack suffered crippling wounds to his legs, and was shell-shocked and gassed in various battles of the First World War. I was aware of his disabilities from childhood, and I've written stories about how his wounds inspired my curiosity about that war. But there's one story I have never told, mainly for fear of it being misunderstood, and my dear grandfather being considered in a poor light, without compassion. And I loved that kind, gentle man too much for that to happen. But I will tell it now, and probably never again. I was born in rural Kent, England, to parents who "escaped" post-WW2 London after they were married in 1949, and then who, for various reasons, decided to return when I was a toddler. That return didn't last long, because after ten months of living with my grandparents, they couldn't wait to get back to Kent. I think my unhappiness had a lot to do with it, because I was a country kid already used to fields and farmland. In London, while my parents were at work all day, I was left in the care of my grandparents. Grandad was only about 69, but years of pain and a compromised respiratory system made him seem much older. I was a high energy child used to an endless playground, so I know I must have been unbearable in London, because I can remember the velocity with which I would race to the park, past bombsites and still-broken buildings, when my mother came home from work. After we'd had lunch one day, my grandparents and me, I asked to leave the table to play with my toys. What happened next is as clear in my mind's eye as if it happened yesterday. I had a rag doll with a red jumpsuit and a plastic face. She had big eyes, rosy cheeks and cherubic lips, and she went everywhere with me. I began running around the table, waving my doll, squealing as I played, fizzy with pent up energy like a bottle of soda ready to pop. I remember looking up at my grandfather and seeing him become agitated, his body shaking and his eyes wide and watering. He seemed to be looking past me. Then he grabbed a knife from the table, snatched the doll from my hands and stabbed her in the forehead, twisting the blade before pulling it out. A guttural cry came from his throat as he threw the doll along the hallway and began to weep. My grandmother made a fuss of finding a dressing for my doll's forehead, and pronounced her "all better." When satisfied that I was settled, she went to her husband, who was paralyzed by what had come to pass. I remember the feeling that enveloped me, even then - it was a sense of his despair. I bore no lasting wound, in the way that child psychologists might suggest, though as I grew older I wanted to know more about the events and memories that shaped such despair, and what terrors from his soldiering days had been triggered anew by a child's unleashed energy. I reached adulthood with everything I understood about the broad and deep human cost of conflict weighing heavy on my heart. In Grandad's war hundreds of thousands of families in Britain, Canada, Australia, New Zealand, Ireland, South Africa, France, Belgium, Germany, India, Nepal - the list goes on - were impacted by that one battle. Jack Winspear marched to the Somme Valley 90 years ago, little knowing how his experiences might affect the family that was yet to be, and never in the world dreaming that a granddaughter named for him would write about it one day. I have on my desk the base of a shell found in a field close to Serre in the Somme Valley. It would have been filled with shrapnel ready to kill and maim upon impact. Today it is polished to a shine, and now holds my pens. 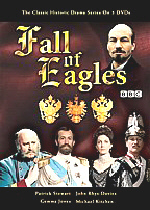 Originally airing on the BBC in 1974, Fall of Eagles dramatically recounts the fates of the three dominate royal ruling houses of Europe: the Hapsburgs of Austria-Hungary, the Romanovs of Russia and the Hohenzollerns of Germany. This epic 13-part series tells of the fall of the dynasties after centuries of despotism, due to the lack of social reform and the social, political and military effects of the Great War. Watching this series allows you to be enthralled and enraged at the same time. The rulers are exceedingly powerful and unwittingly delicate at the same time. Their innate "divine rule" arrogance and distance from their subjects and the rise of liberal social reform spell their deaths but they're too remote from everyday reality to cope with the very factors that will mean their downfall and oblivion and lead to the Great War and the slaughter of millions. Michael Hordern serves as the unseen series narrator. The exceptionally gifted large cast can be divided into the various houses. The Romanovs and other Russians include Tony Jay (Tsar Alexander II), Charles Kay (Tsar Nicholas II), Gayle Hunnicutt (Tsarina Alexandra), Michael Aldridge (Rasputin), Frederick Alexander (Tsarevich Alexis), John Phillips (Grand Duke Nicholas), Kenneth Colley (Father Gapon), Michael Bryant (Ratchkowsky), Hugh Burden (Protopopov), Patrick Stewart (Lenin), Michael Kitchen (Trotsky) and Jim Norton (Kerensky). The stand outs here are Charles Kay and Gayle Hunnicutt as the Tsar and Tsarina, Patrick Stewart as Lenin and Michael Bryant as Ratchkowsky. The Hapsburgs and Austrians include Miles Anderson (Young Franz Josef of Austria-Hungary), Laurence Naismith (Emperor Franz Josef I of Austria-Hungary), Peter Woodthorpe (Archduke Franz-Ferdinand), Pamela Brown (Archduchess Sophia), Susan Tracy (Crown Princess Stephanie of Austria), Ann Castle (Grand Duchess Sergei), Rachel Gurney ('Sisi', Empress Elizabeth of Austria), Diane Keen (Young 'Sisi', Empress Elizabeth of Austria) and Irene Hamilton (Baroness Vetsera). Episode 4 "Requiem for a Crown Prince" covering the suicide and murder of Archduke Rudolf and Mary Vetsera at the hunting lodge Mayerling, show Laurence Naismith, Rachel Gurney and Irene Hamilton at their best. 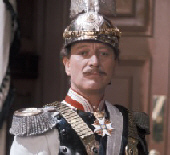 The Hohenzollerns and other Germans include Maurice Denham (Kaiser Wilhelm I) Colin Baker (Crown Prince Willie), Barry Foster (/Kaiser Wilhelm II), Denis Lill ('Fritz' Prince Frederick William/Frederick III), Gemma Jones (Princess Vicky), Curt Jürgens (Otto von Bismarck), Michael Bates (Von Ludendorff), Marius Goring (Von Hindenburg) and John Robinson (Muller). Barry Foster gives a superb performance as "Willy," Kaiser Wilhem II (although there seems to be some uncertainty as just how disabled his left arm was). Curt Jürgens as Bismarck steals his episodes with some of the best lines that can be attributed to the actual Bismarck. The French and English are represented by John Bennett (Georges Clemenceau), Tom Criddle (Foreign Secretary Sir Edward Grey), Mavis Edwards (Older Queen Victoria), Perlita Neilson (Younger Queen Victoria), Frank Thornton (Prince Albert of England) and Derek Francis (Edward VII of England). The sets are magnificent with many of the great stately manor houses of England substituting for the various European palaces. The costumes are incredibly detailed and lavish. Released by Koch Vision on 4 DVDs at a list price of $49.98 it is readily available at discounts when ordered on-line. The running time is 10 hours, 50 minutes. Bonus features include interviews with Charles Kay (Tsar Nicolas II), Gayle Hunnicutt (Tsarina Alexandra) and David Cunliffe, director on 3 episodes and a Photo Gallery. Overall the picture quality is excellent, although some episodes are not as sharp as others. The sound is in Dolby Digital but there are no subtitles which would have been helpful. The British DVD release included a 40 page informative booklet with a family tree which is not found in the US release. The script for Episode 6, "Absolute Beginners" starring Patrick Stewart as Lenin, written by Trevor Griffiths is included in "Collected Plays for Television." Griffiths also wrote the screenplay for Reds (1981), directed by Warren Beatty. The book, Fall of Eagles by C.L. Sulzberger is still available at used bookstores, both brick & mortar and on-line. The following are thanked for their contributions to this issue of the Trip Wire:Stephen Harris, Tom Jones, Bob Denison, Shawnee Brown, Tony Noyes, Esther MacCallum-Stewart, Andy Melomet, Len Shurtleff. Until next month, your editor, Mike Hanlon.